Any tourist knows you can get thirsty seeing the sights, and even in the January cold, the Inauguration promises to keep a lot of people licking their (chapped) lips. But what better way to quench your thirst than with a bottle of commemorative Obama water? Hundreds of vendors traveling to D.C. from across the nation will tote boxes of your basic street-friendly plastic bottle with Obama's face glued to the front ($1-$3). Hotel gift shops are luring patrons with similarly dressed-up plastic bottles, some featuring the whole First Family. 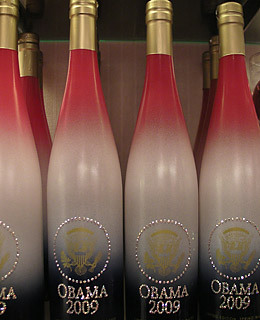 But the classiest Obama thirst quencher we found was a rhinestone-studded glass bottle labeled "Obama 2009," which can be purchased at the Willard Hotel's Travel Traders gift shop ($55).